Kim loves custard desserts so after our soy panna cotta experience, she wanted to make something more rich, so a classic creme brulee it was! A classic creme brulee is smooth, creamy, and decadent so we opted not to fussy it up too much. However, we had a windfall of dragon fruit from Kim’s aunt’s garden which made for the perfect light and tropical fruit topping to contrast the richness of the creme brulee. Coincidently we also had a brand new kitchen gadget to play with as part of the Foodbuzz Tastemakers program. The Oxo egg beater. 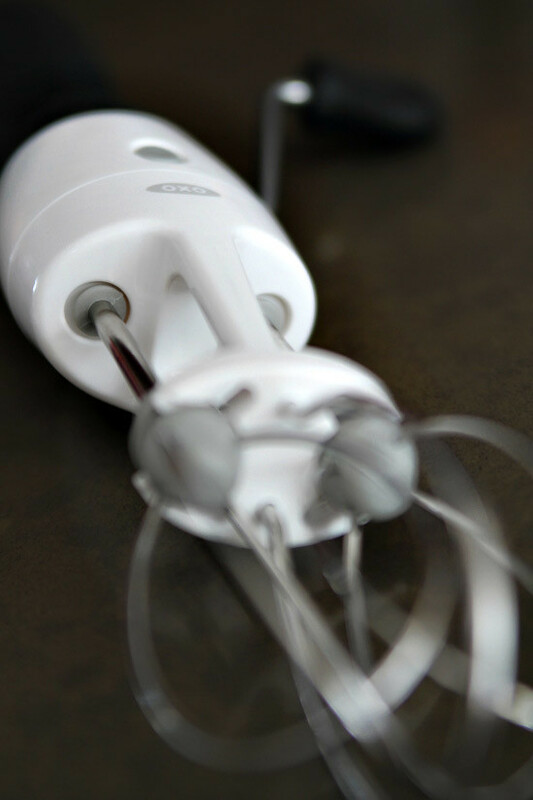 If you’ve ever used a regular egg beater you know that cleaning can be a pain. So what’s so special about this one compared with your grandmother’s? Well for one, the beaters are removable for quick clean up, but if a deeper cleaning is necessary, the entire base is removable and even dishwasher safe. We love the fact that there’s a stable bridge slightly longer than the beaters that rests in the bowl, allowing for smooth, frictionless beating to our hearts content. 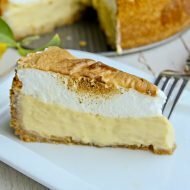 It’s the perfect solution for light batters, eggs, whipping cream or whenever you don’t feel like lugging out the stand mixer. 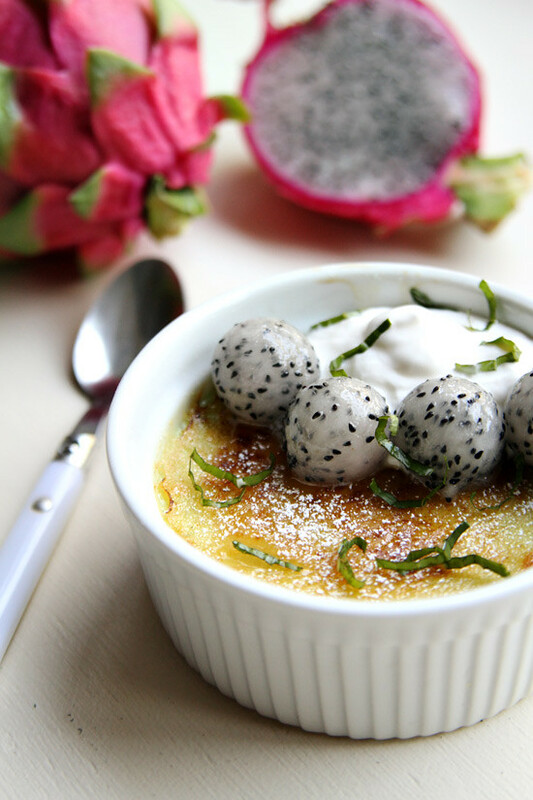 Use a melon baller to make pearls of dragon fruit and finish the dish with a dallop of tangy creme fraiche and bright mint and you’ve got a classic yet elegant dessert. In medium sauce pan on medium high, add cream and vanilla bean along with scrapings until it just begins to boil, then turn off heat and cover for about 15 minutes. Preheat oven to 325F. 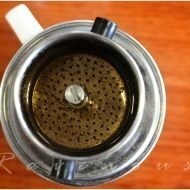 Bring to boil 2 qt of hot water in a tea kettle. 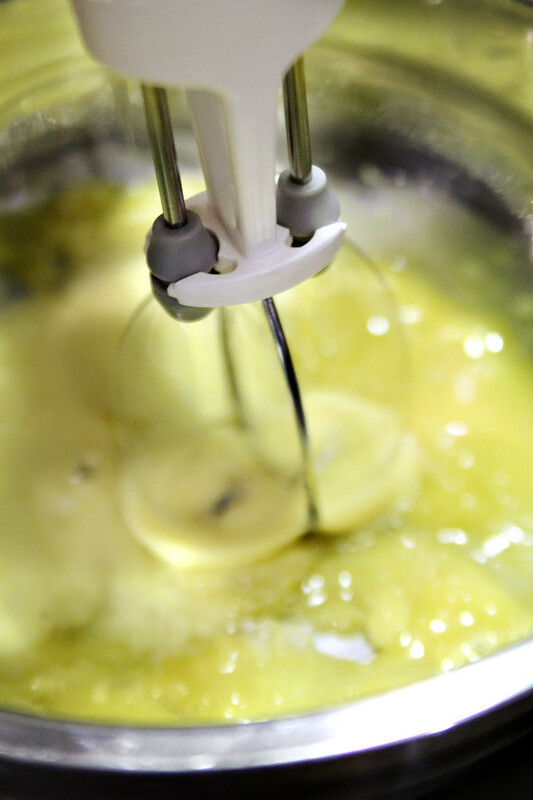 In mixing bowl, combine the egg yolks and 1/2 cup of sugar and beat until it is smooth and turns light yellow. Then add your cream and continuously stir. Place your baking pan in the oven and pour the hot water around the ramekins covering about 1/2 the ramekin. Then pour in the creme brulee mixture and bake until set (firm but the center jiggles when nudged), about 35-40 minutes. Remove from the oven and cool for at least 2-3 hours. Using a melon baller, make "pearls" of dragon fruit and chiffonade the mint/basil. When ready to serve, evenly spread a layer of sugar with the remaining 4 tablespoons (use less if desired) over the creme brulee and torch (with heavy duty hardware store torch) until golden brown. 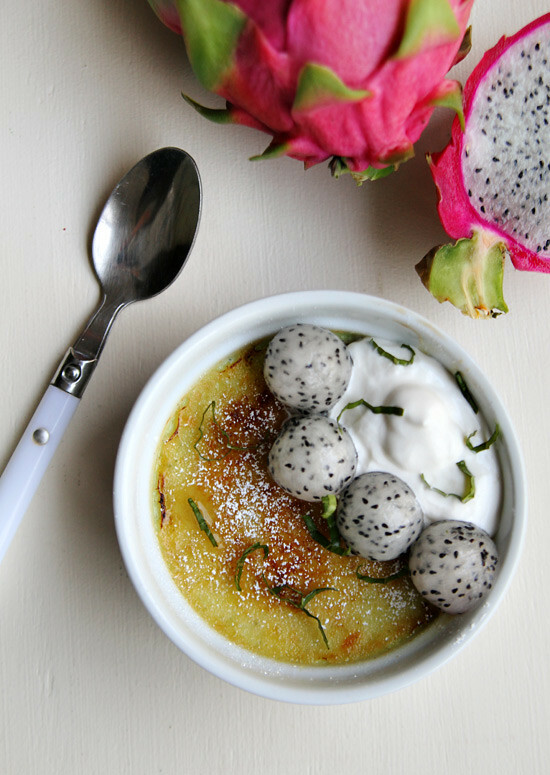 Top the creme brulee with dallop of creme fraiche, dragon fruit pearls, and mints. Sift with a fine layer of confectioners sugar and enjoy. Mmm, the boyfriend and I love making (and eating!) creme brulee … will play around with your variation sometime! Your blog is a gem. I love reading your posts. Thank you for your gifts. I would not have thought of this combination. It sounds brilliant and makes for a stunning presentation. You guys are lucky to have a good source for dragon fruit. we are lucky, but hopefully one of these days we’ll be able to grow all all of these fruits in our garden and you guys are welcome to come by anytime! 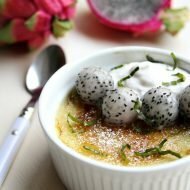 You had me at creme brulee but adding dragon fruit? 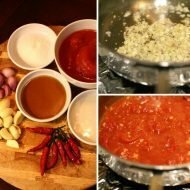 I am so excited to try this recipe!